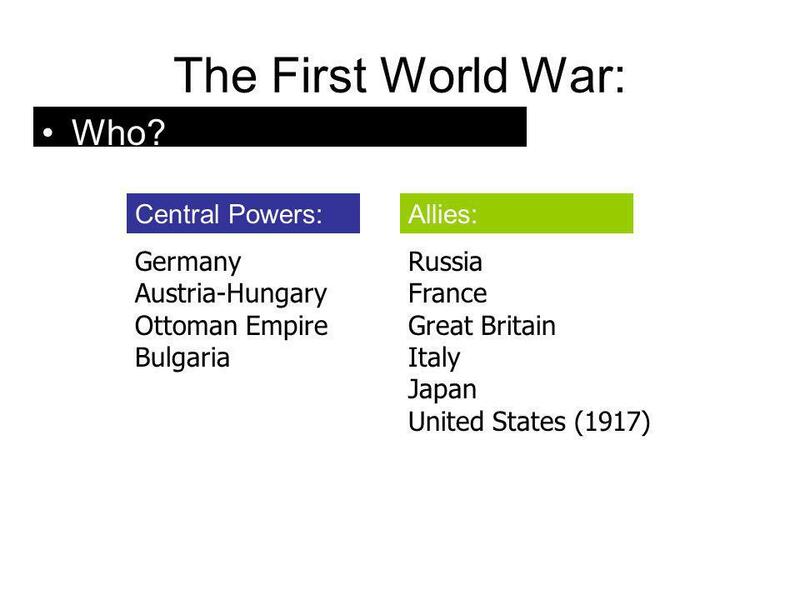 The First World War: What? When? 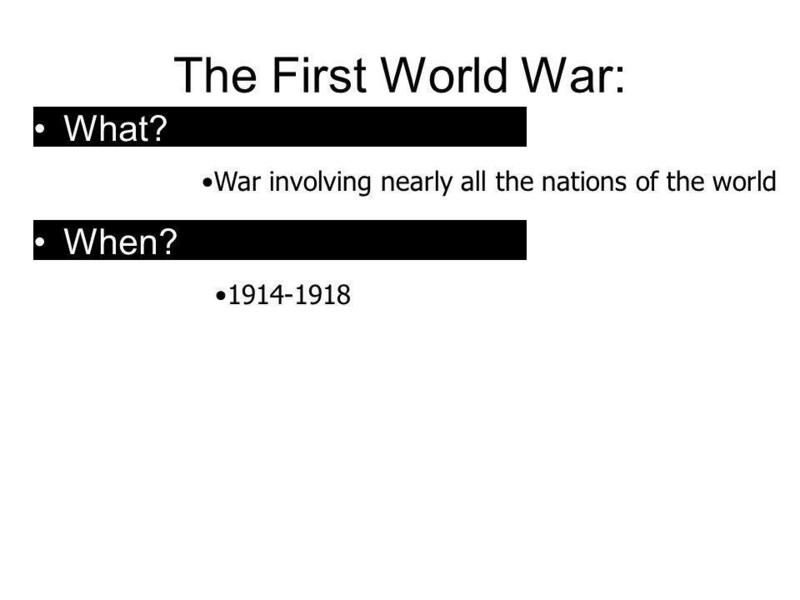 1 The First World War: What? When? 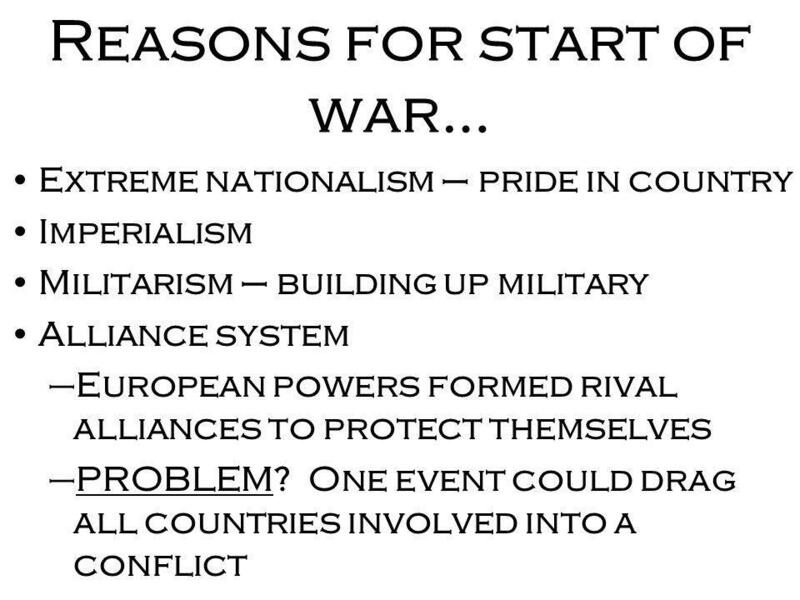 War involving nearly all the nations of the world When? 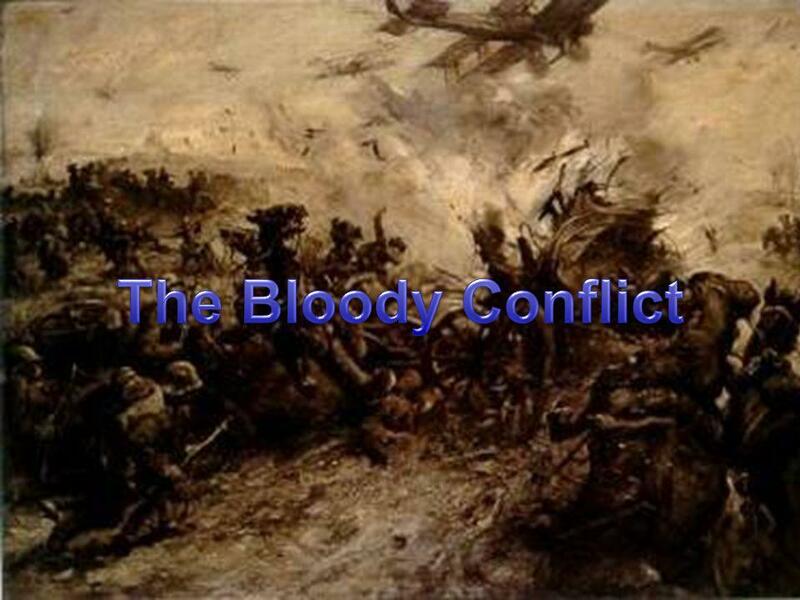 Extreme nationalism – pride in country Imperialism Militarism – building up military Alliance system European powers formed rival alliances to protect themselves PROBLEM? 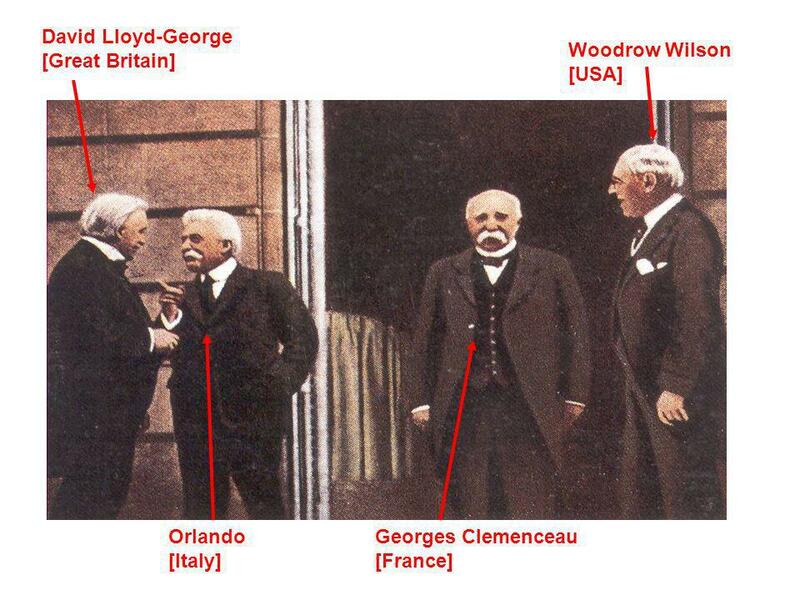 One event could drag all countries involved into a conflict. 4 The Black Hand.. 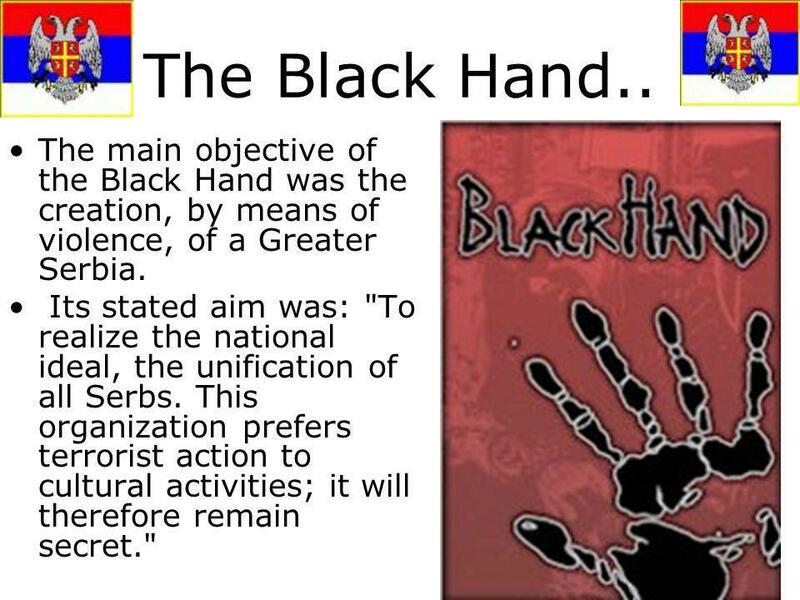 The main objective of the Black Hand was the creation, by means of violence, of a Greater Serbia. 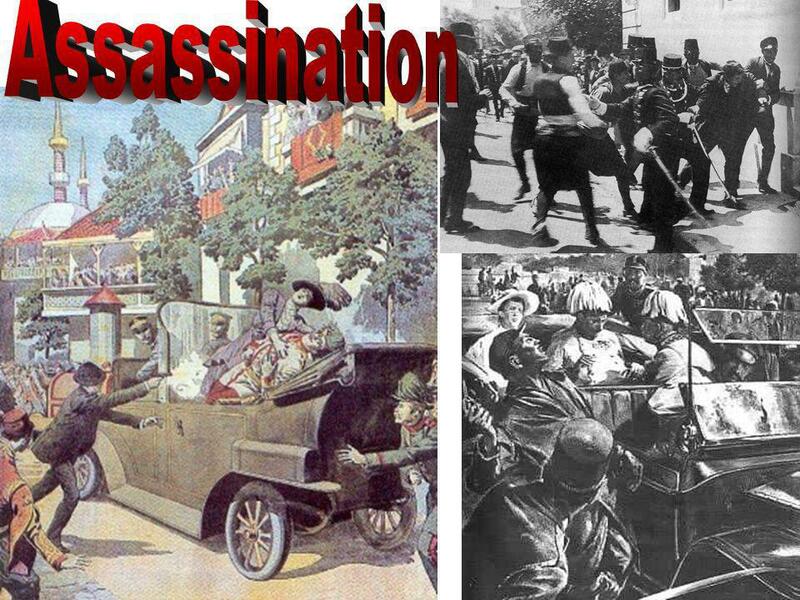 Its stated aim was: "To realize the national ideal, the unification of all Serbs. This organization prefers terrorist action to cultural activities; it will therefore remain secret." 5 The spark that lit the fuse…. 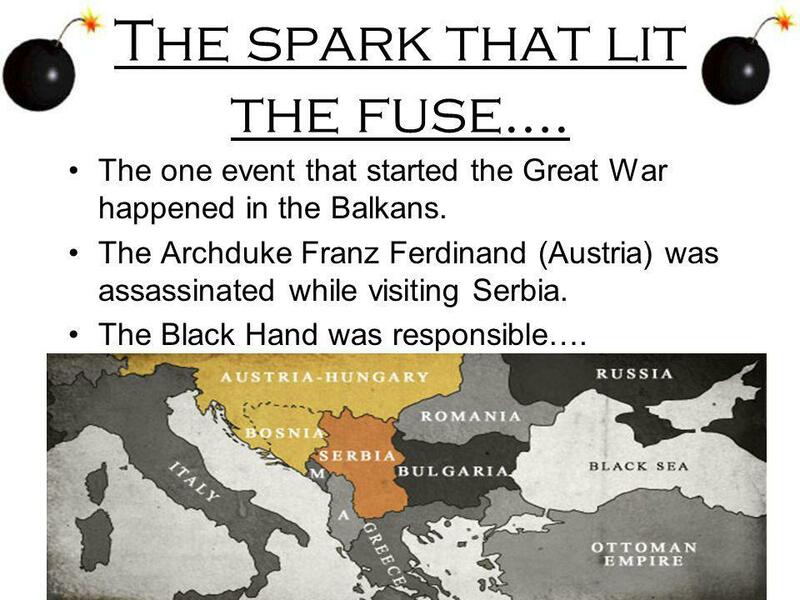 The one event that started the Great War happened in the Balkans. 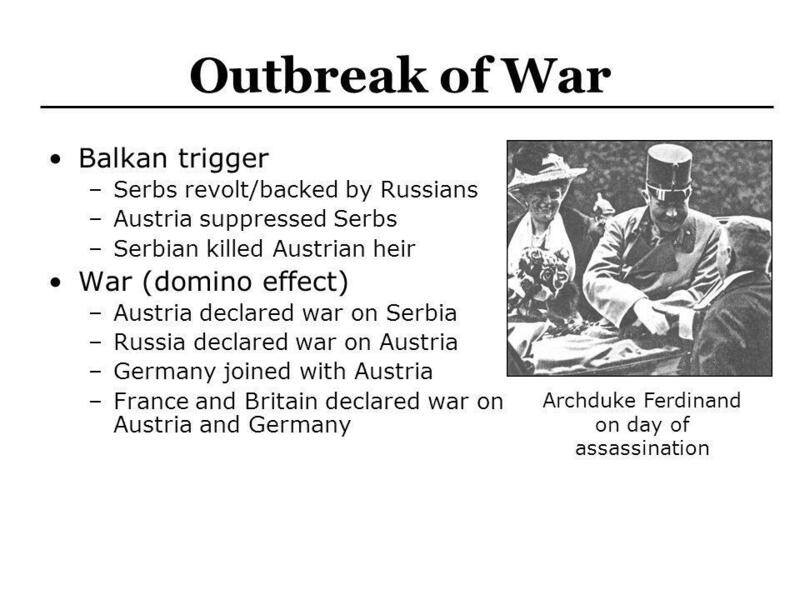 The Archduke Franz Ferdinand (Austria) was assassinated while visiting Serbia. 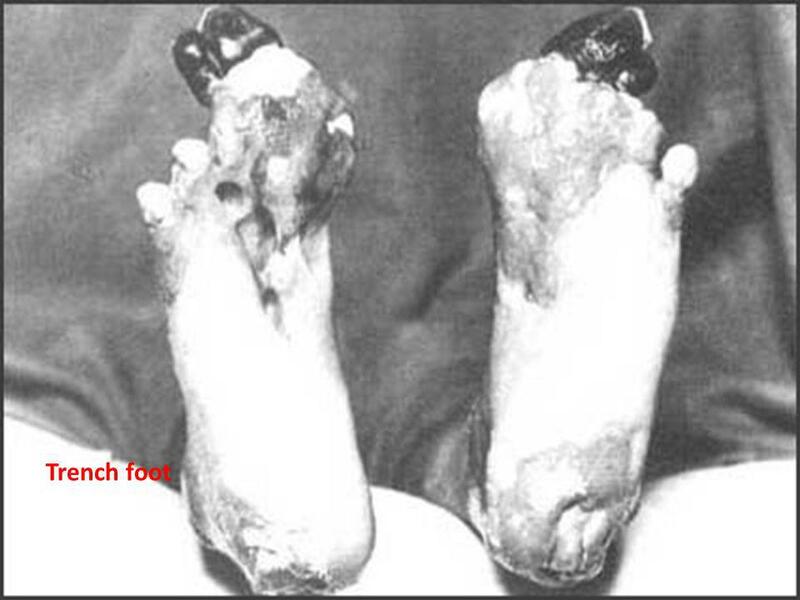 The Black Hand was responsible…. 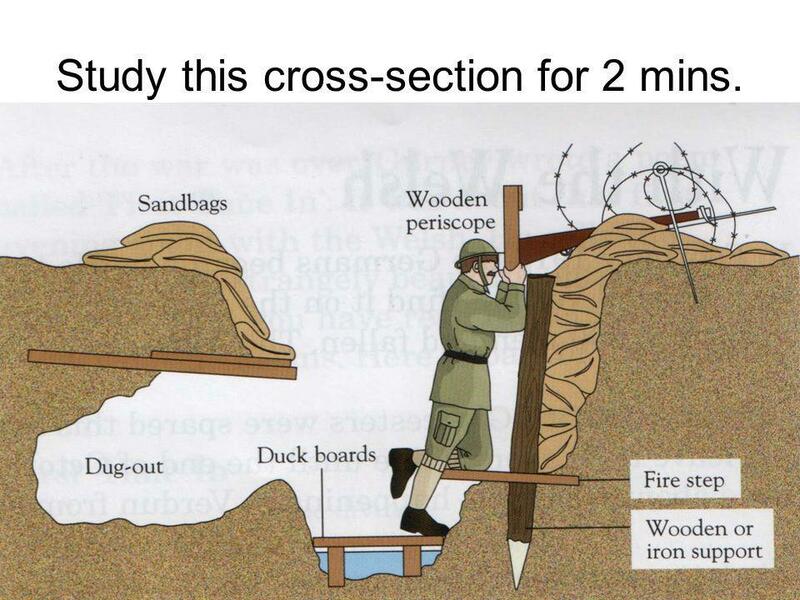 13 Study this cross-section for 2 mins. 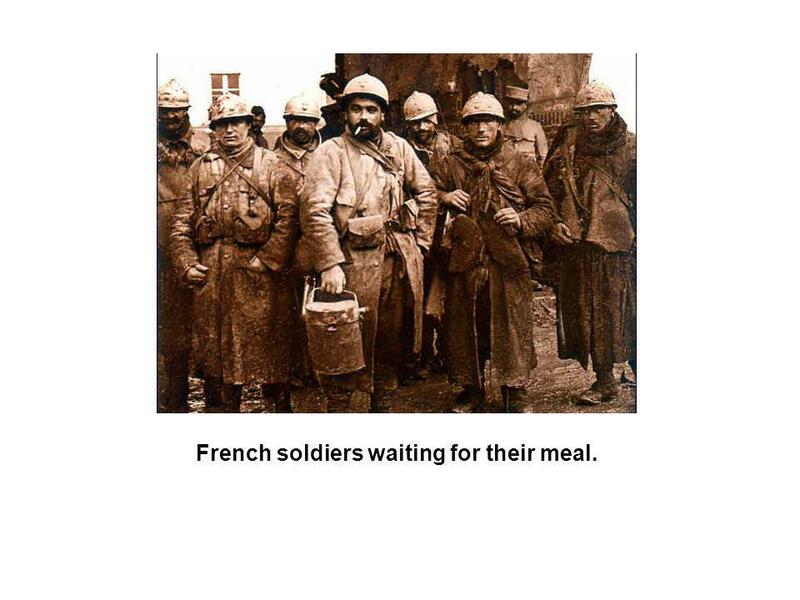 16 French soldiers waiting for their meal. 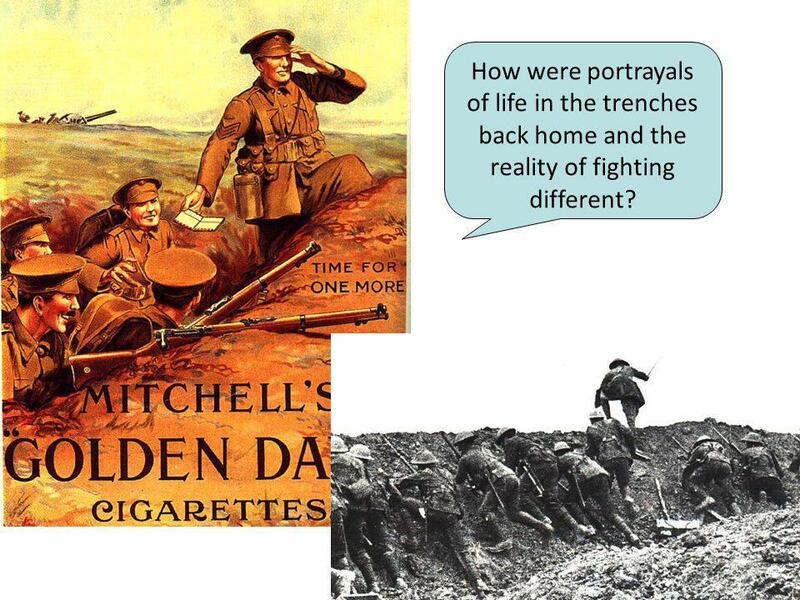 20 How were portrayals of life in the trenches back home and the reality of fighting different? 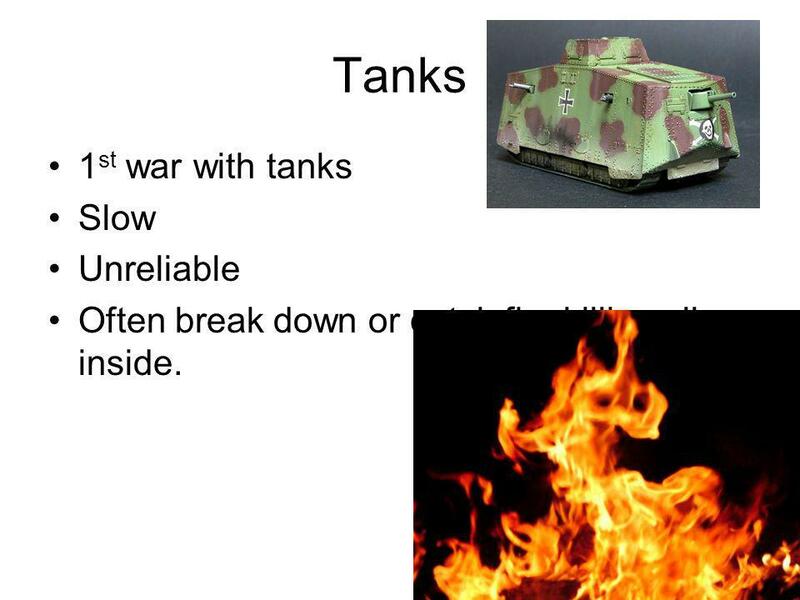 Often break down or catch fire killing all inside. 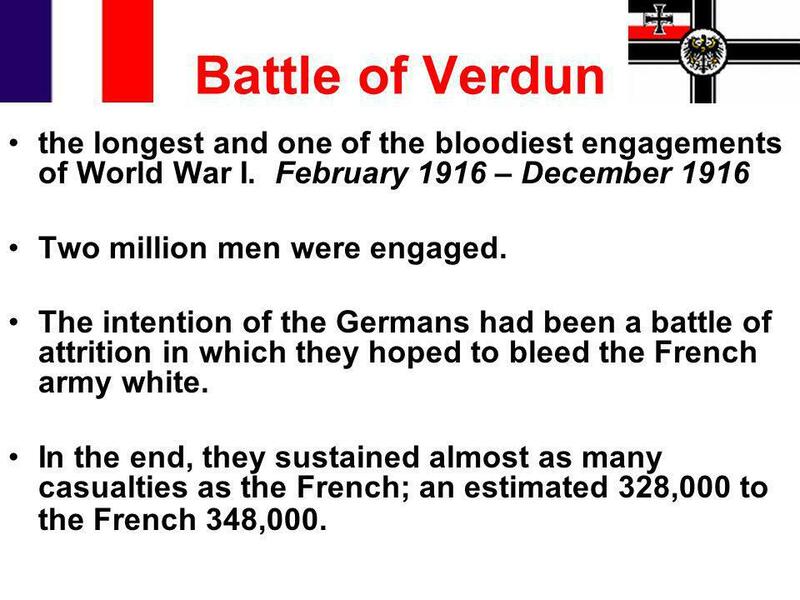 36 Battle of Verdun the longest and one of the bloodiest engagements of World War I. February 1916 – December 1916 Two million men were engaged. 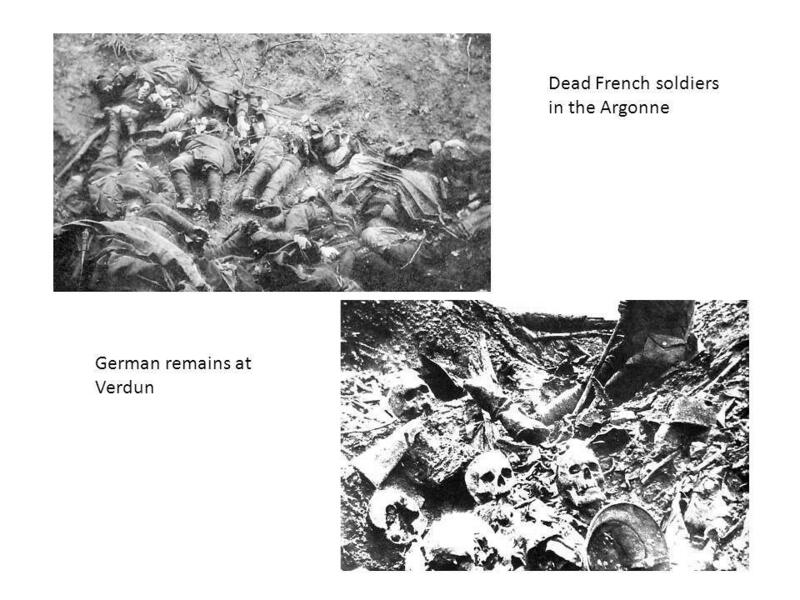 The intention of the Germans had been a battle of attrition in which they hoped to bleed the French army white. 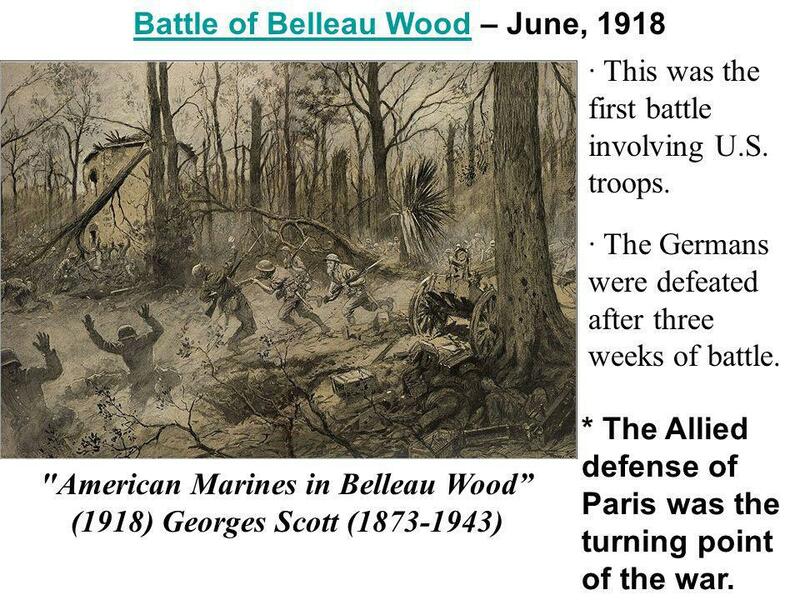 In the end, they sustained almost as many casualties as the French; an estimated 328,000 to the French 348,000. 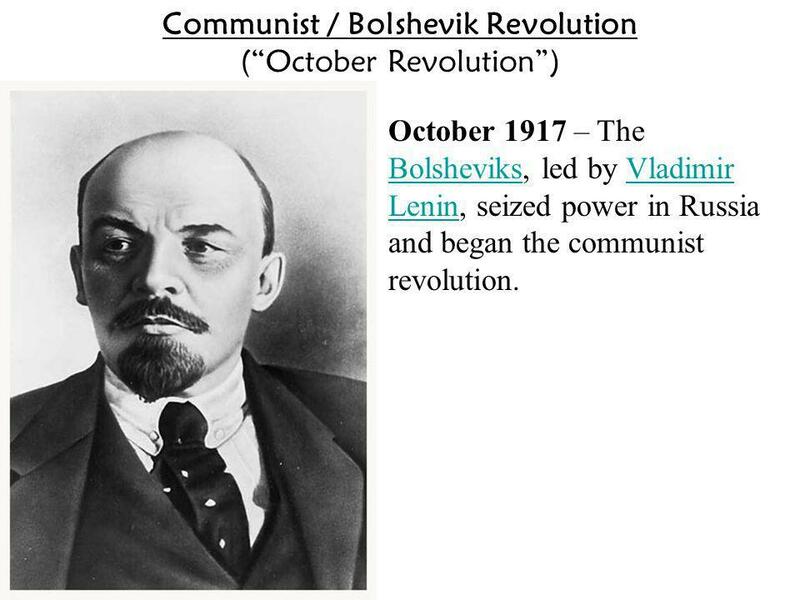 October 1917 – The Bolsheviks, led by Vladimir Lenin, seized power in Russia and began the communist revolution. 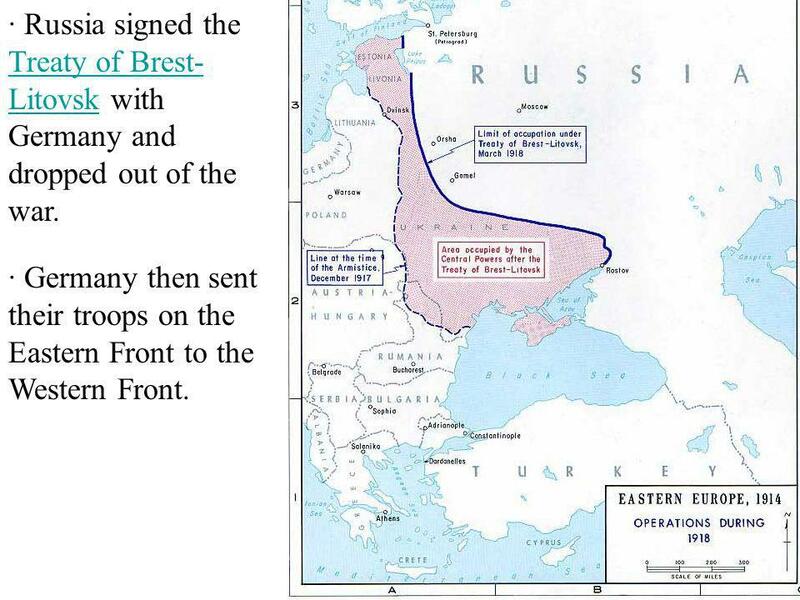 41 · Russia signed the Treaty of Brest-Litovsk with Germany and dropped out of the war. 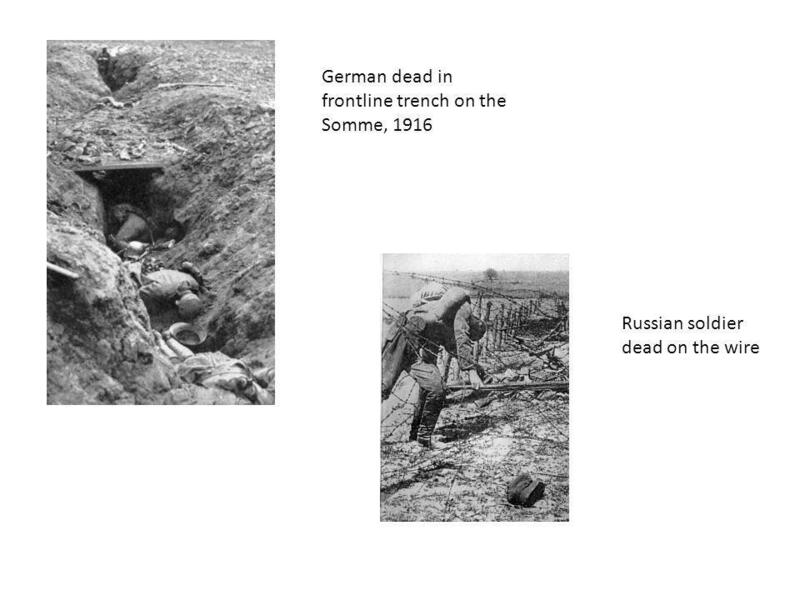 · Germany then sent their troops on the Eastern Front to the Western Front. 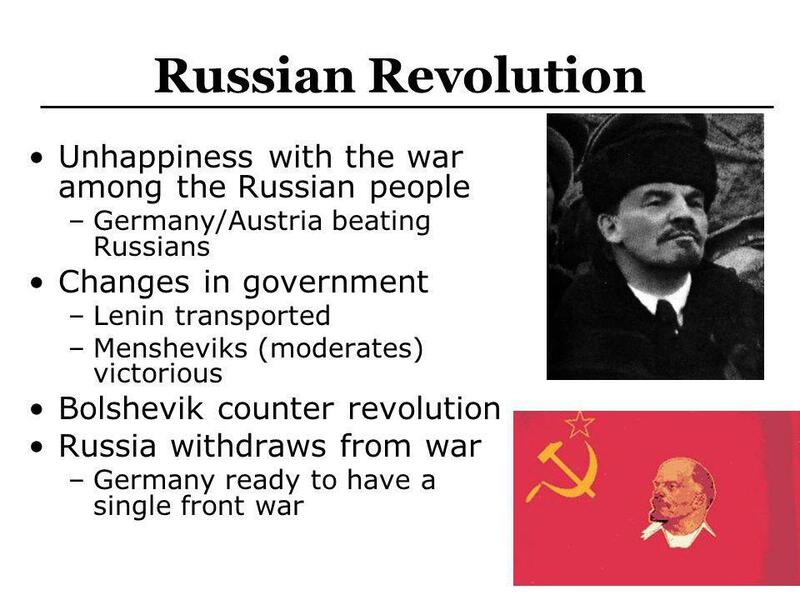 42 Communism – a theory that supports the elimination of private property and the equal distribution of goods Facts: · Supports the violent revolution of the working class against the “bourgeois” ruling class. 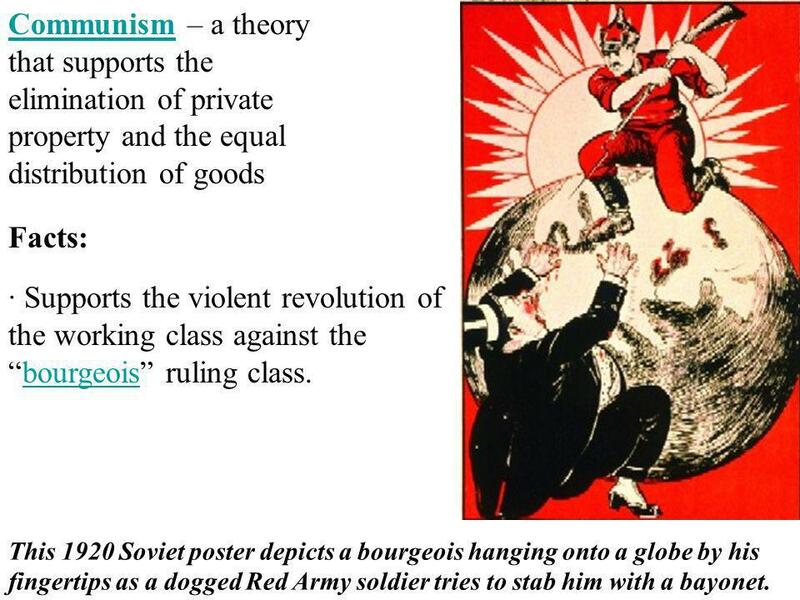 This 1920 Soviet poster depicts a bourgeois hanging onto a globe by his fingertips as a dogged Red Army soldier tries to stab him with a bayonet. 43 · Led by a single, authoritarian political party. 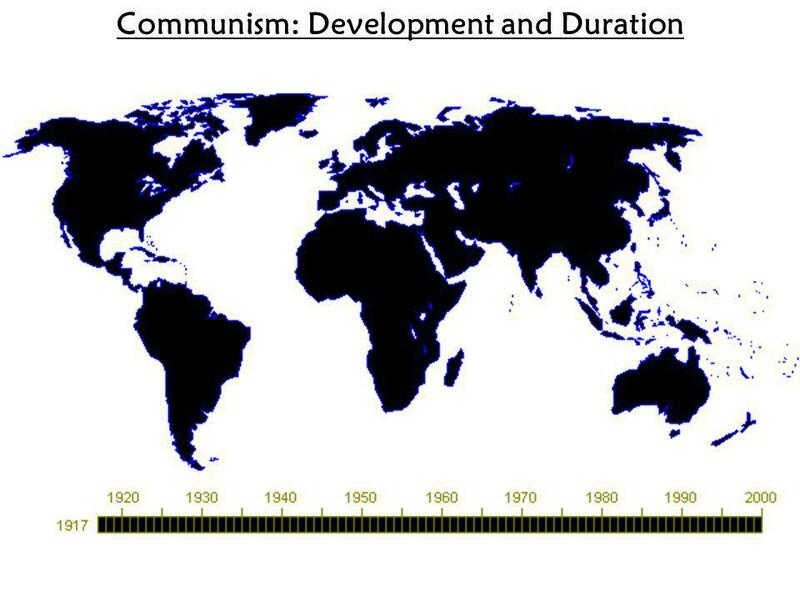 Communism – a theory that supports the elimination of private property and the equal distribution of goods Facts: · Led by a single, authoritarian political party. 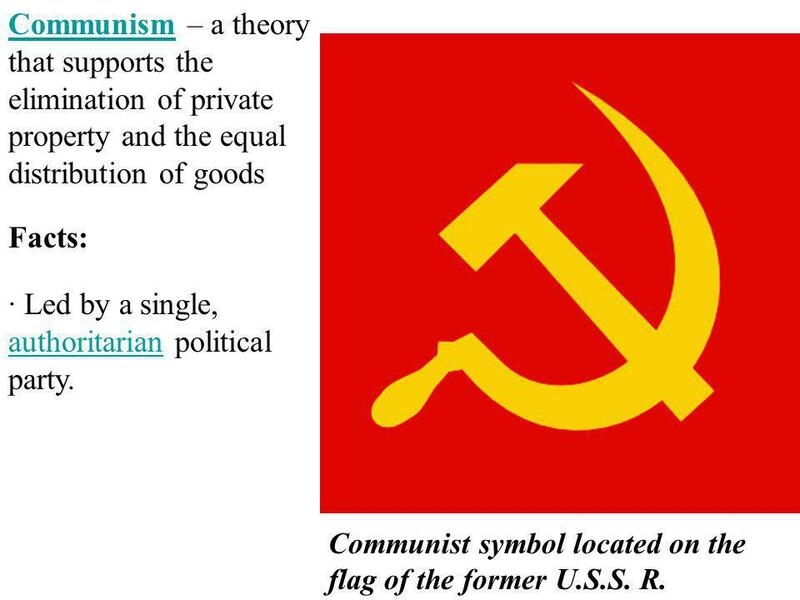 Communist symbol located on the flag of the former U.S.S. 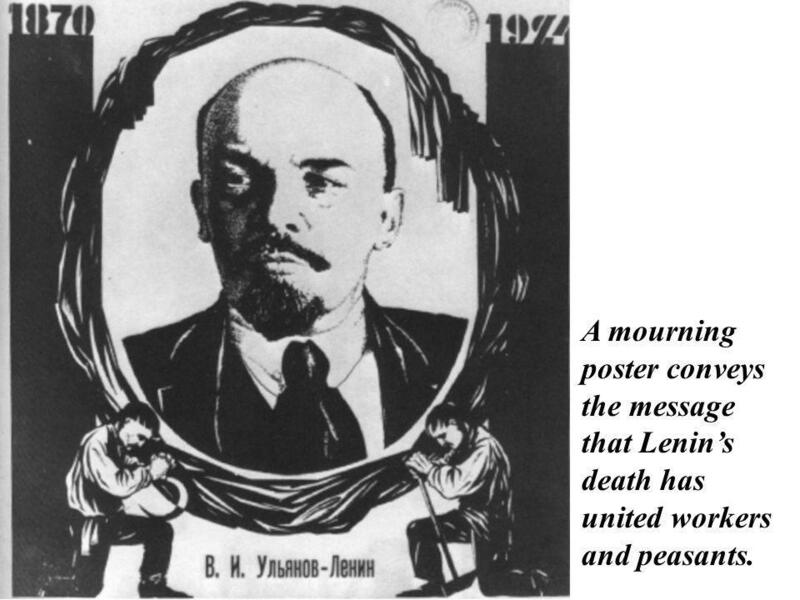 R.
44 A mourning poster conveys the message that Lenin’s death has united workers and peasants. 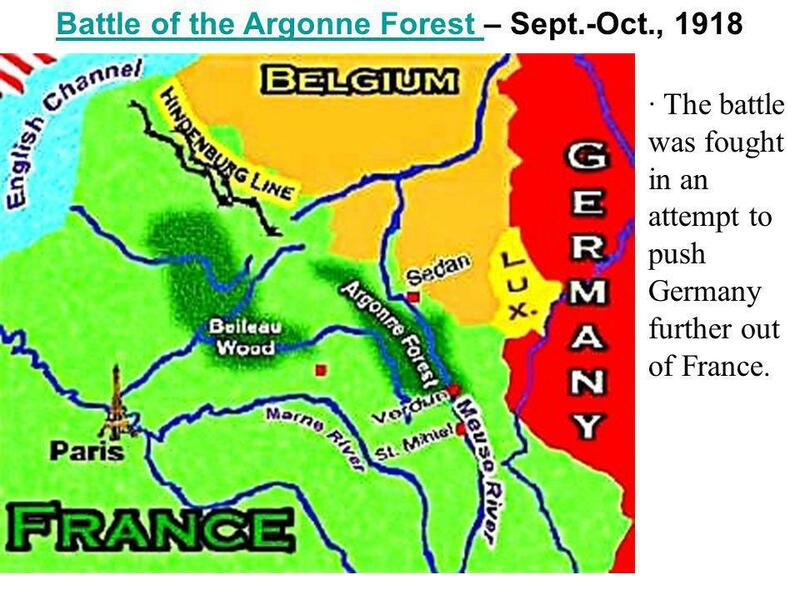 · The battle was fought in an attempt to push Germany further out of France. 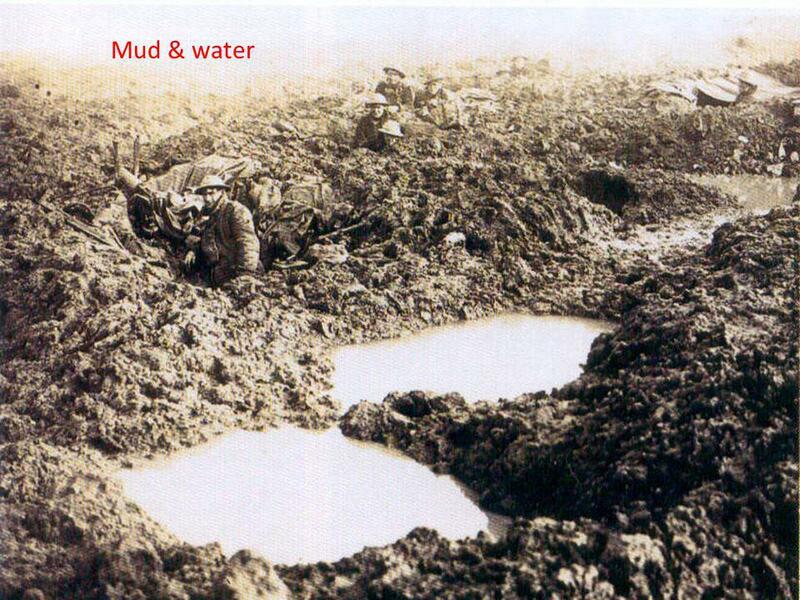 With the failure of the Ludendorf Offensive, and with the exhausted state of Germany, the German generals recognised that it was time to sue for peace with the Allies. 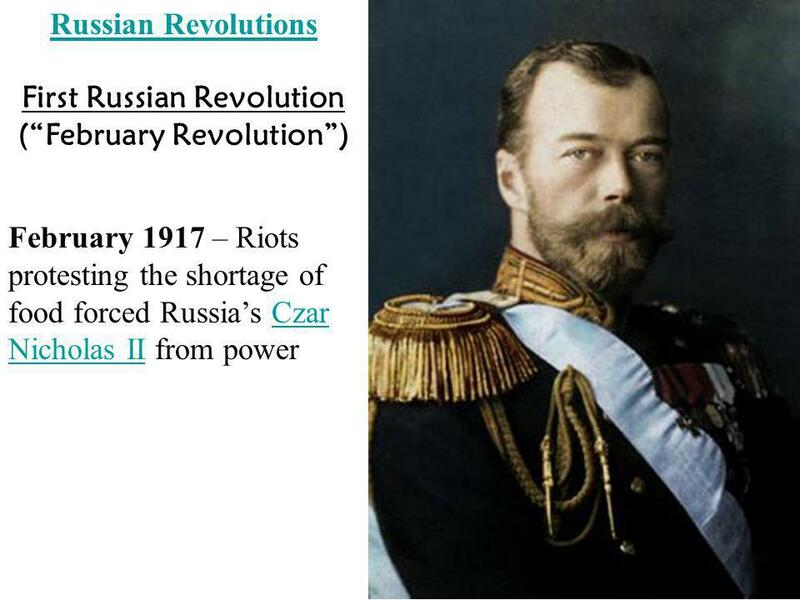 The Kaiser was forced to abdicate on the 8th November and a new democratic republic was established. 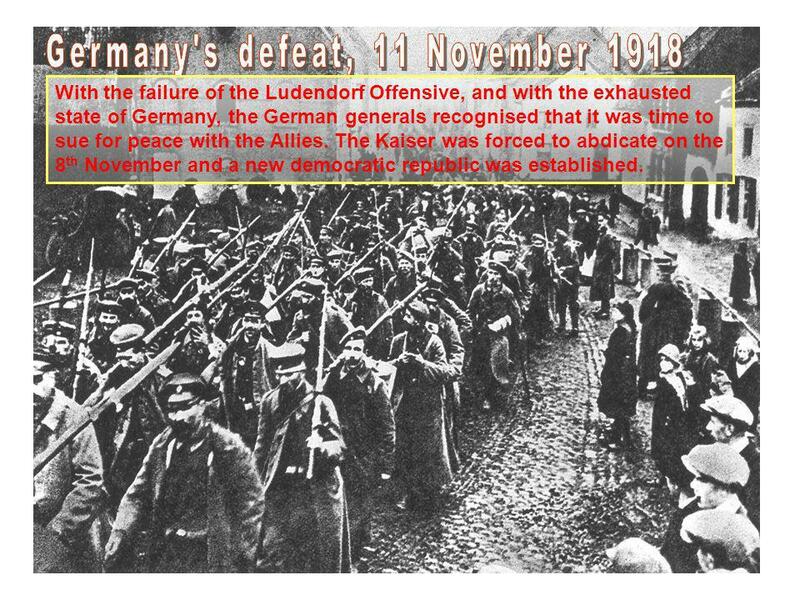 On 8th November 1918, Imperial Germany came to an end when a democratic republic was established. 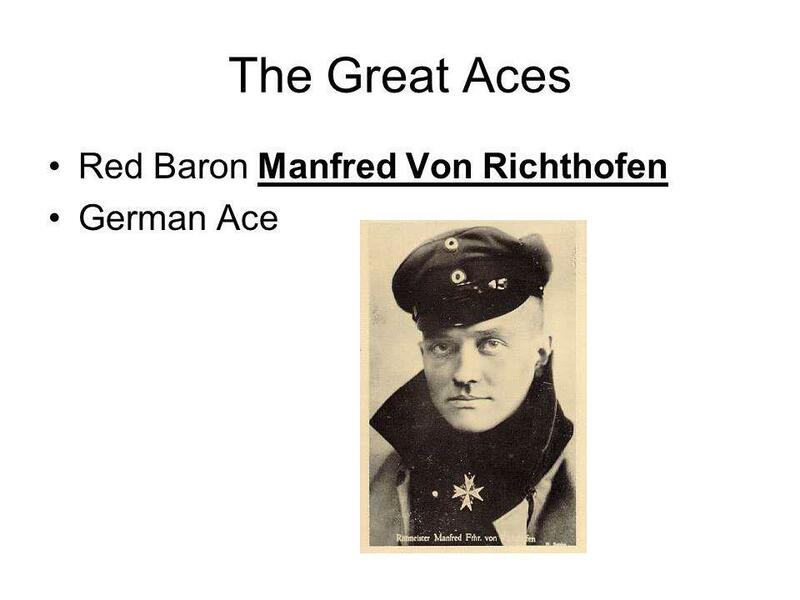 Though it was intended to have Wilhelm tried as a ‘war criminal’ he was eventually allowed to spend the rest of his life in exile in the Netherlands. 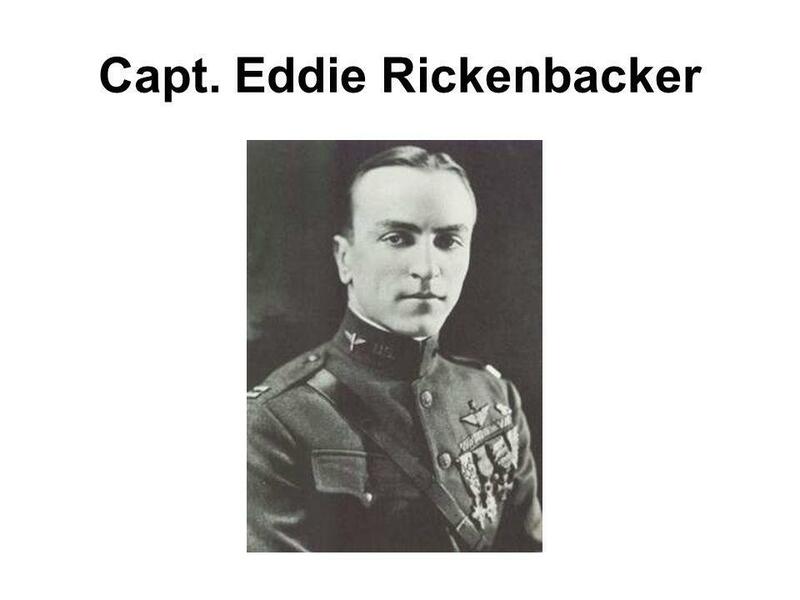 He died in 1941. 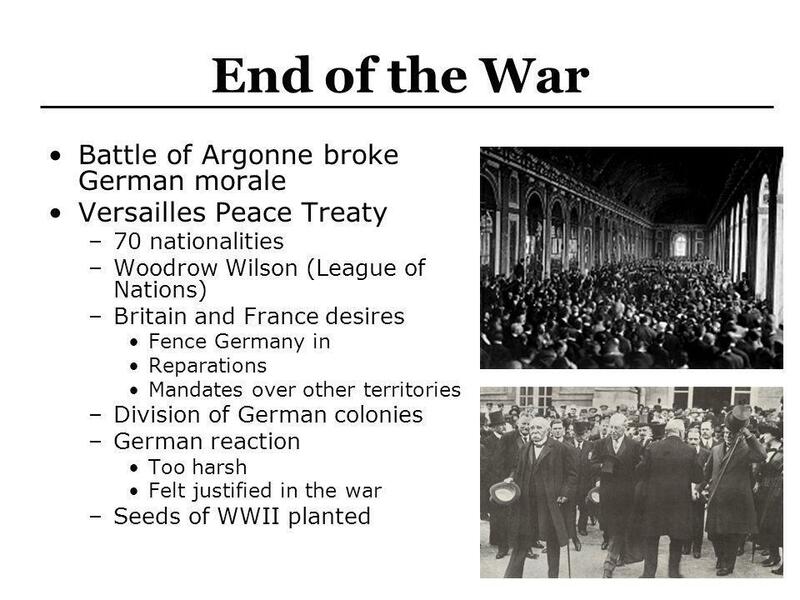 The Treaty was designed to cripple Germany militarily, territorially and economically REVENGE ON GERMANY WAR GUILT CLAUSE Germany had to accept blame for starting WW1 GERMANY’S MILITARY FORCES REDUCED NO UNION WITH AUSTRIA - Army restricted to 100,000 men. 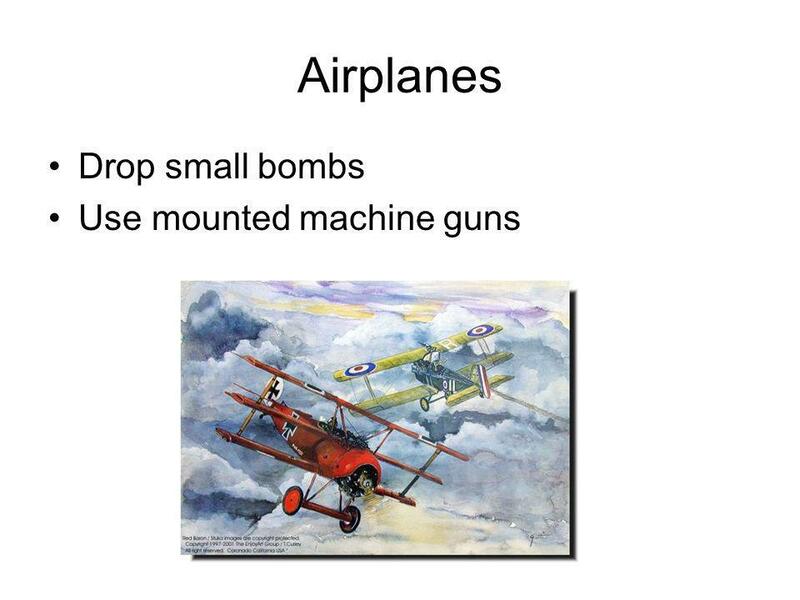 - No modern weapons such as tanks, military air force. 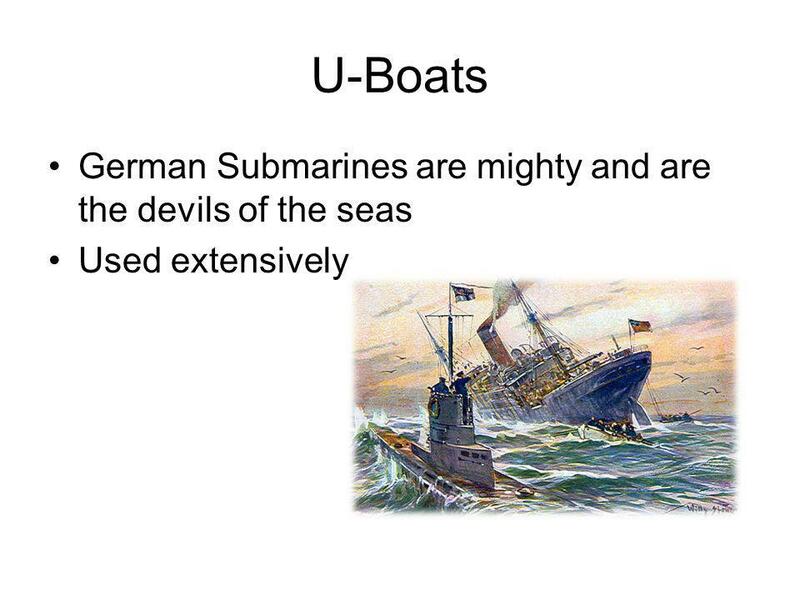 - Navy could not have battle ships over 10,000 tons and no U-Boats. 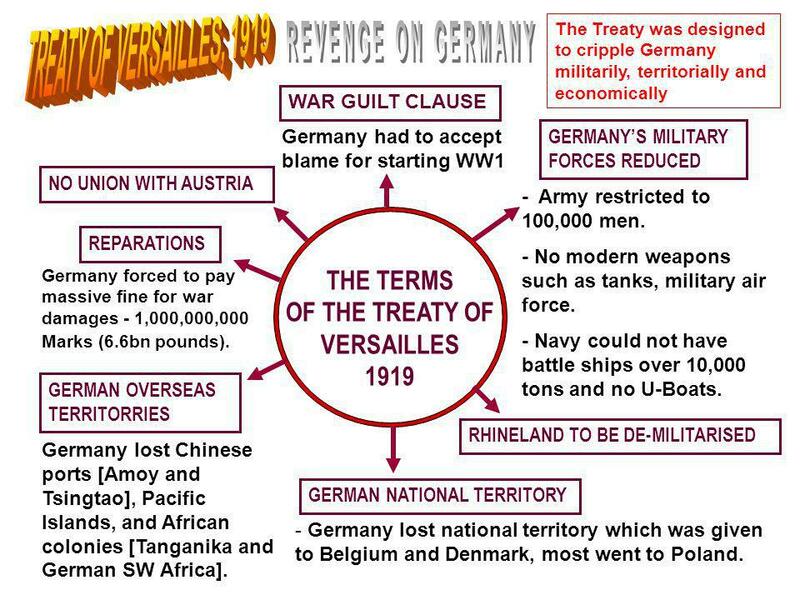 THE TERMS OF THE TREATY OF VERSAILLES 1919 REPARATIONS Germany forced to pay massive fine for war damages - 1,000,000,000 Marks (6.6bn pounds). 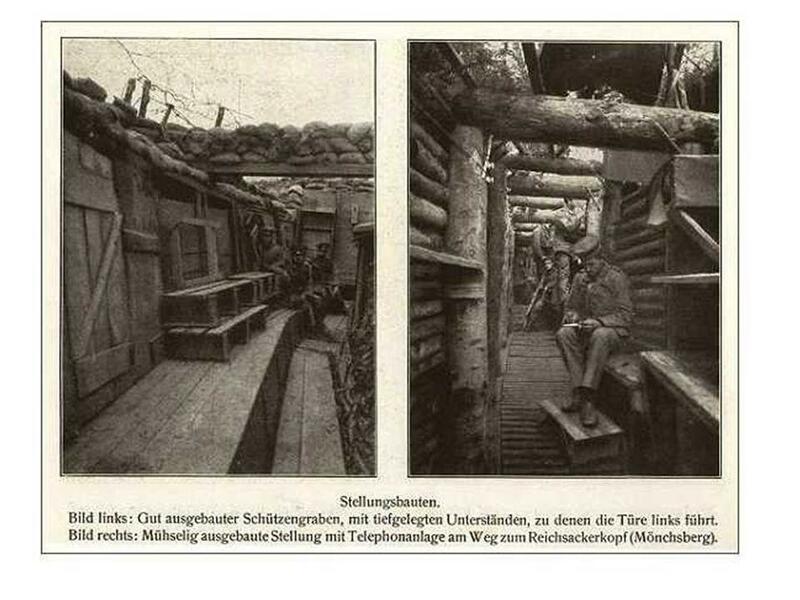 GERMAN OVERSEAS TERRITORRIES RHINELAND TO BE DE-MILITARISED Germany lost Chinese ports [Amoy and Tsingtao], Pacific Islands, and African colonies [Tanganika and German SW Africa]. 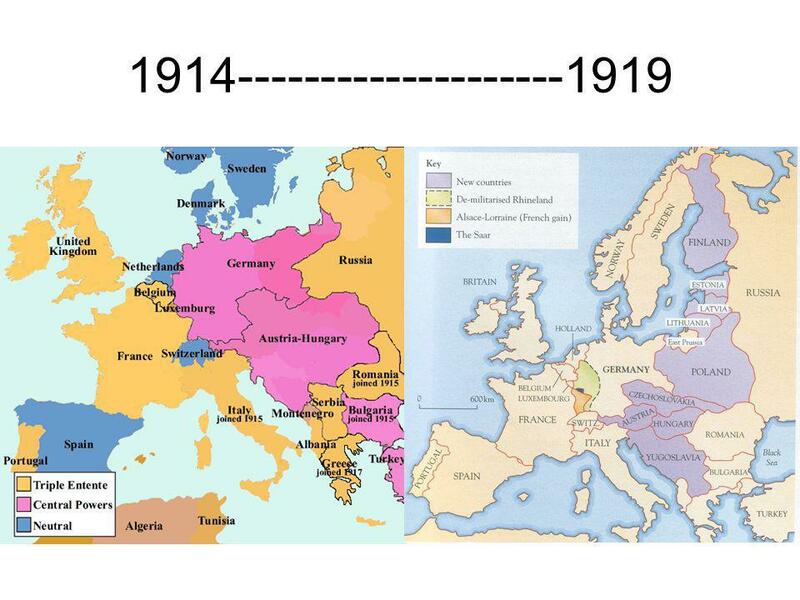 GERMAN NATIONAL TERRITORY Germany lost national territory which was given to Belgium and Denmark, most went to Poland. 53 ‘Punch’ was Britain’s main political magazine of the period. 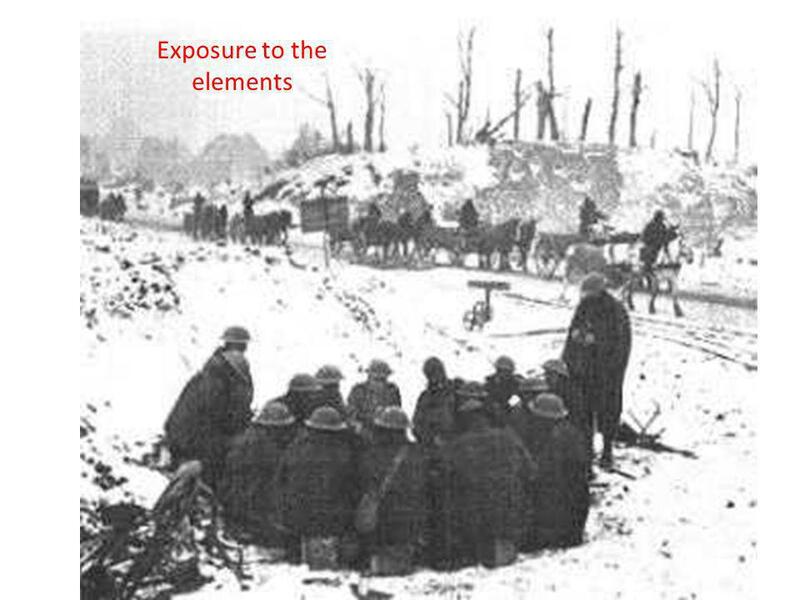 Source 2: Describe the scene shown, what is the storyline? Then, assess the individual features in the cartoon. Then, identify the political message intended by the cartoonist. 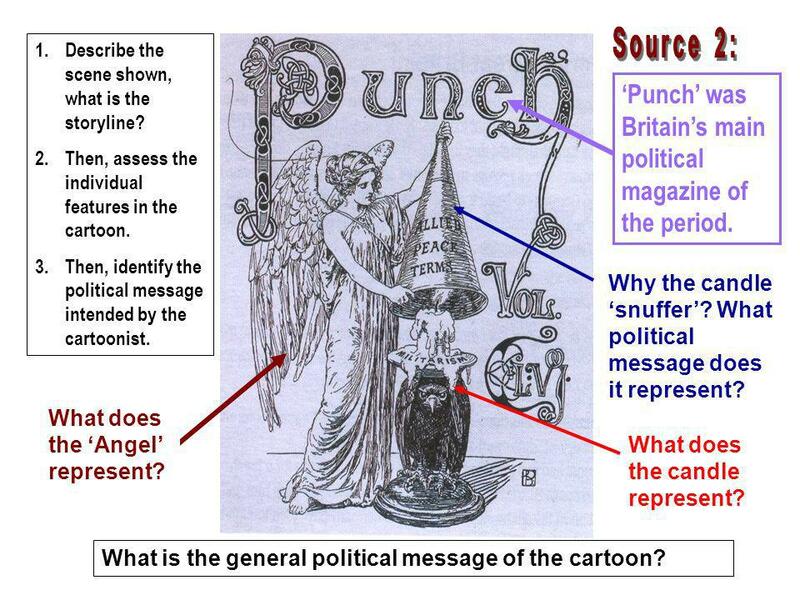 ‘Punch’ was Britain’s main political magazine of the period. Why the candle ‘snuffer’? What political message does it represent? What does the ‘Angel’ represent? What does the candle represent? What is the general political message of the cartoon? i. 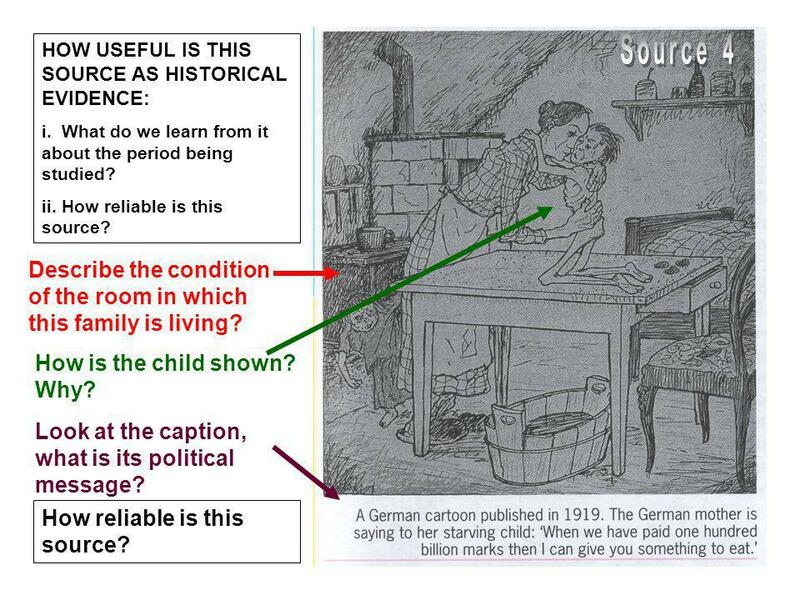 What do we learn from it about the period being studied? ii. How reliable is this source? Source 4 Describe the condition of the room in which this family is living? 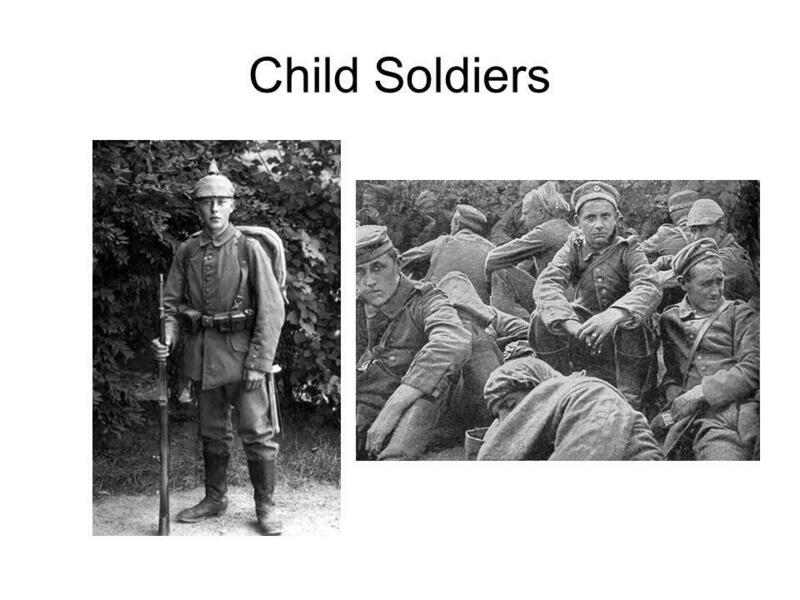 How is the child shown? Why? 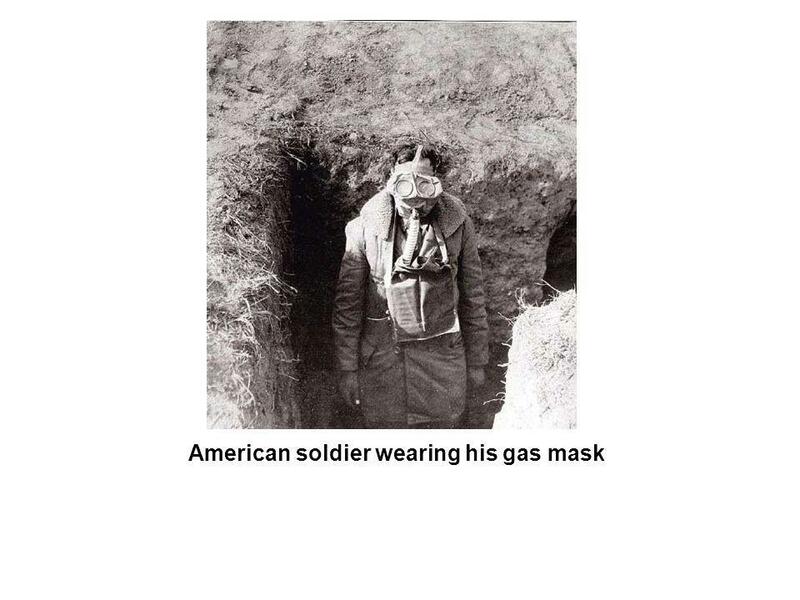 Look at the caption, what is its political message? How reliable is this source? 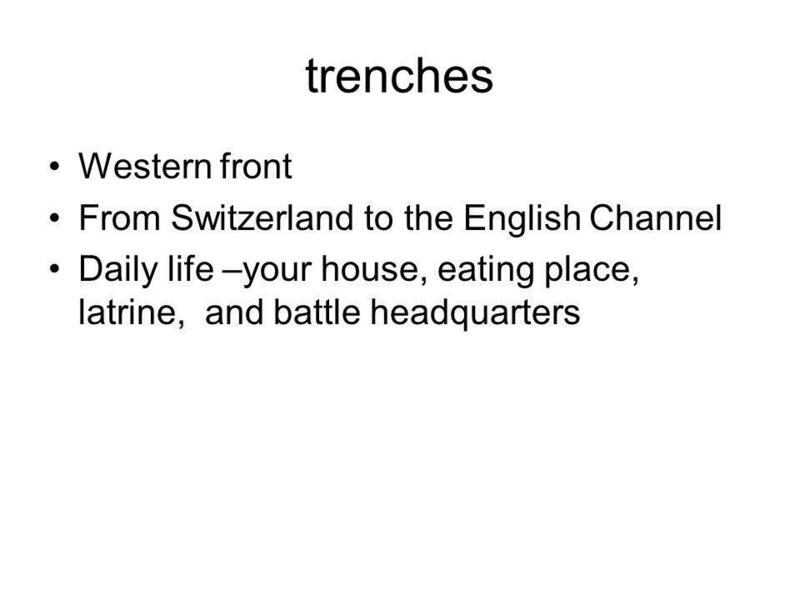 Download ppt "The First World War: What? 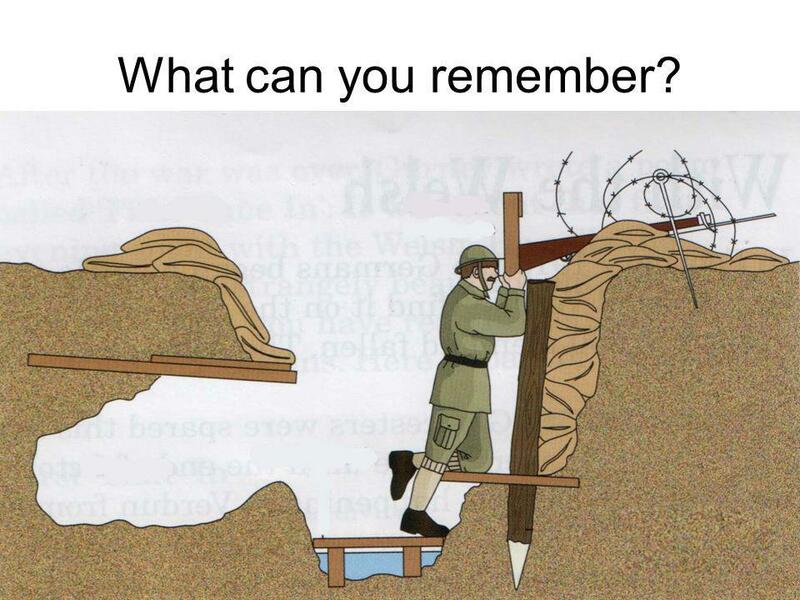 When?" General Information… Map of Europe greatly changed. 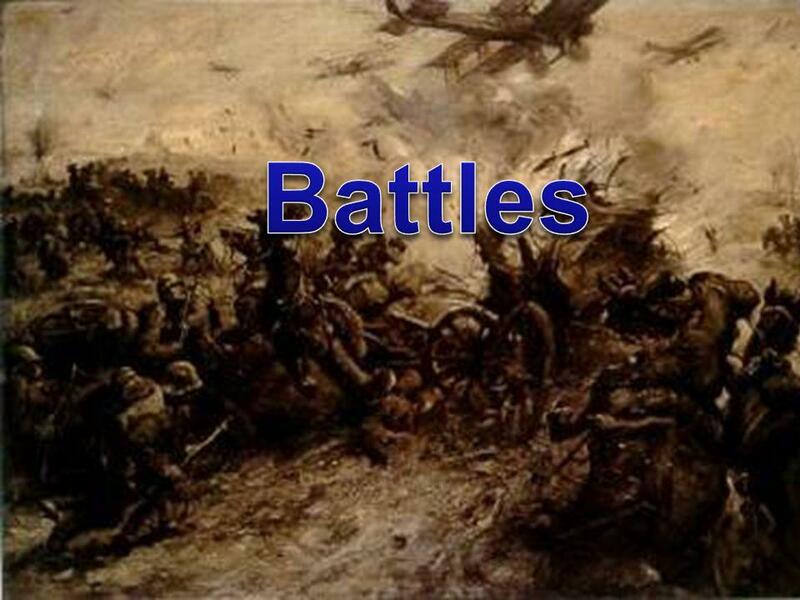 World War I AP World History. 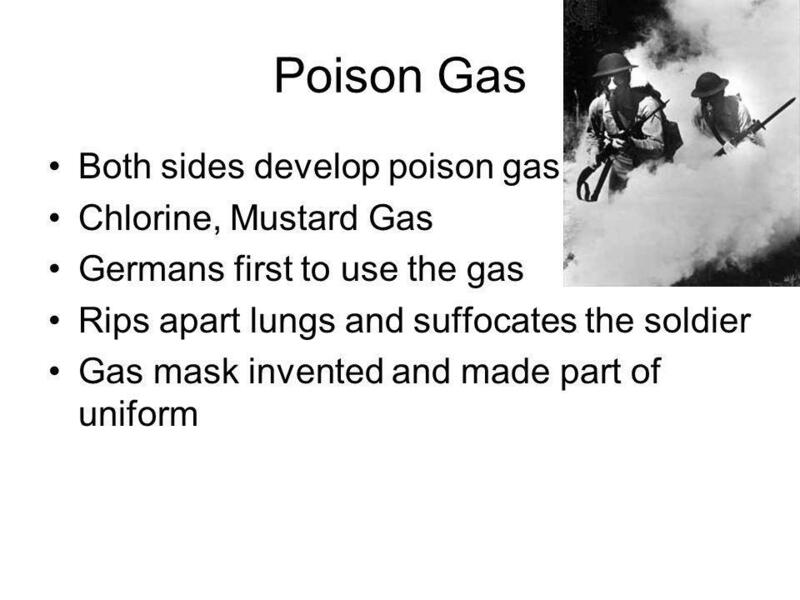 World War I causes of World War I Underlying causes (the fuel): Underlying causes (the fuel): nationalism nationalism imperialism imperialism. 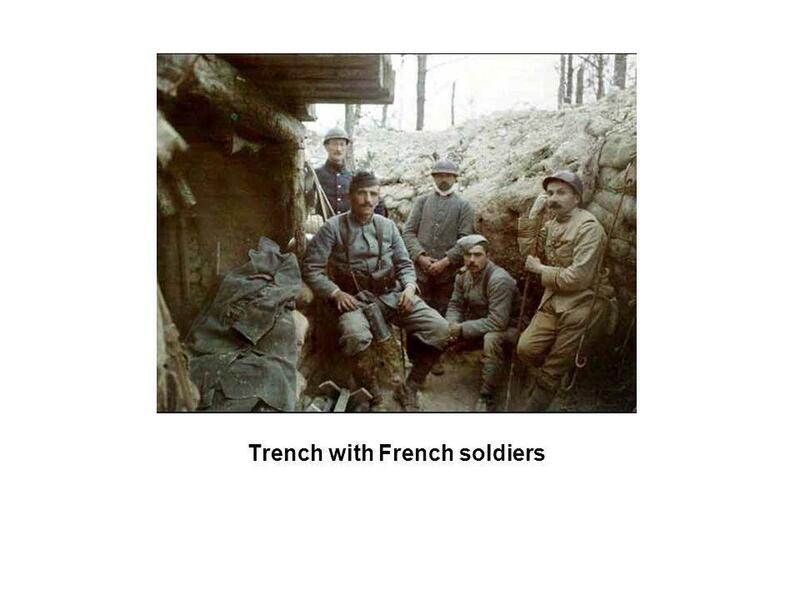 World War I 9 th Grade Social Studies Spring 2014 Unit 10. 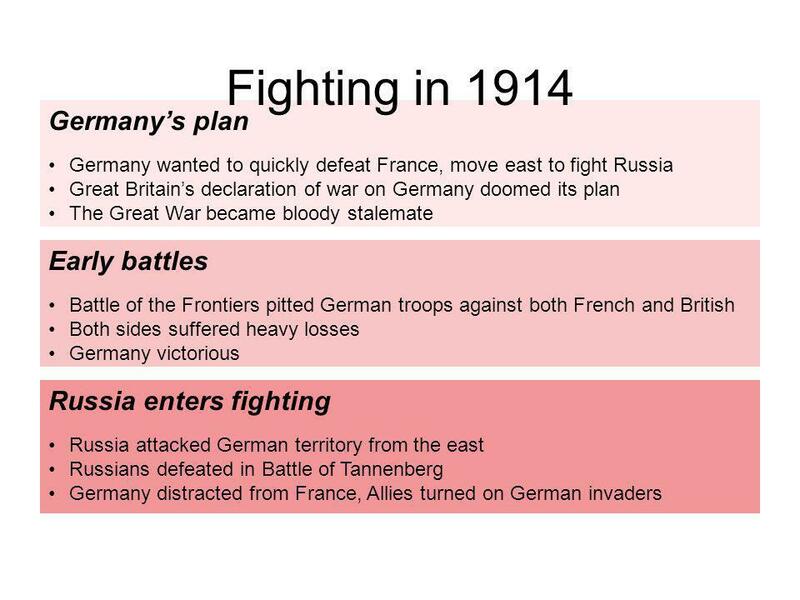 The MAIN causes of World War I MILITARISM – The growth of nationalism and imperialism led to increased military spending ALLIANCE SYSTEM – By 1907 Europe. 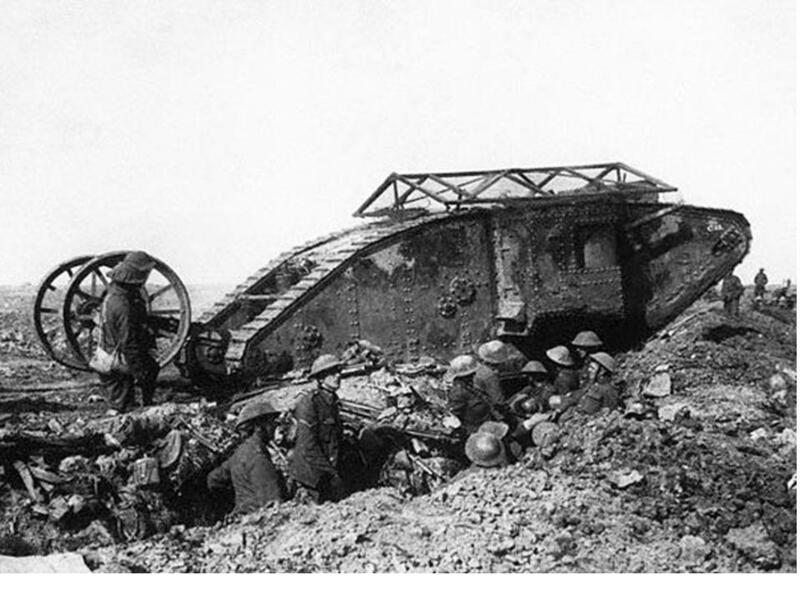 General Information… Started on July 28, 1914 Ended on November 11, 1918 Almost 8,000,000 dead. 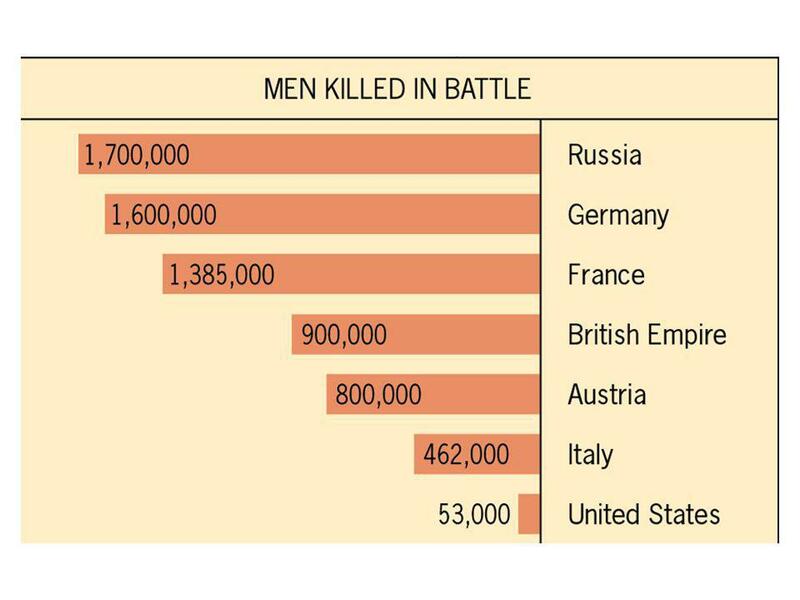 *** Russia the most = 1.7 million Almost 22,000,000 wounded….. 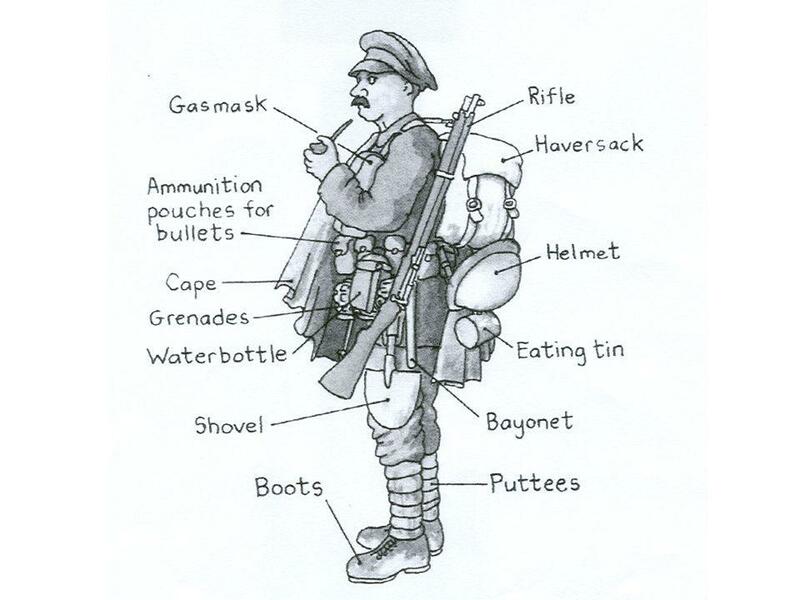 Section 1 World War I. 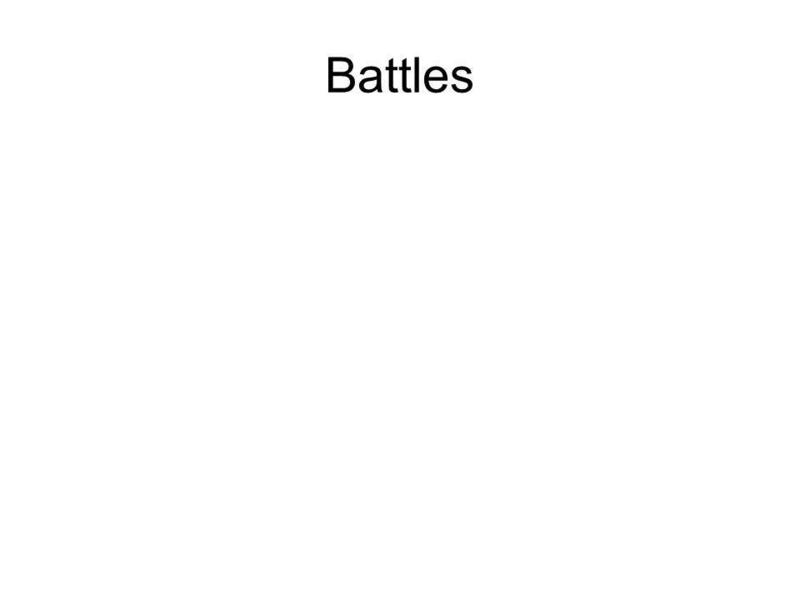 Section 1 World War I Preview Starting Points Map: European Alliances and Military Forces Main Idea / Reading Focus Europe on the. 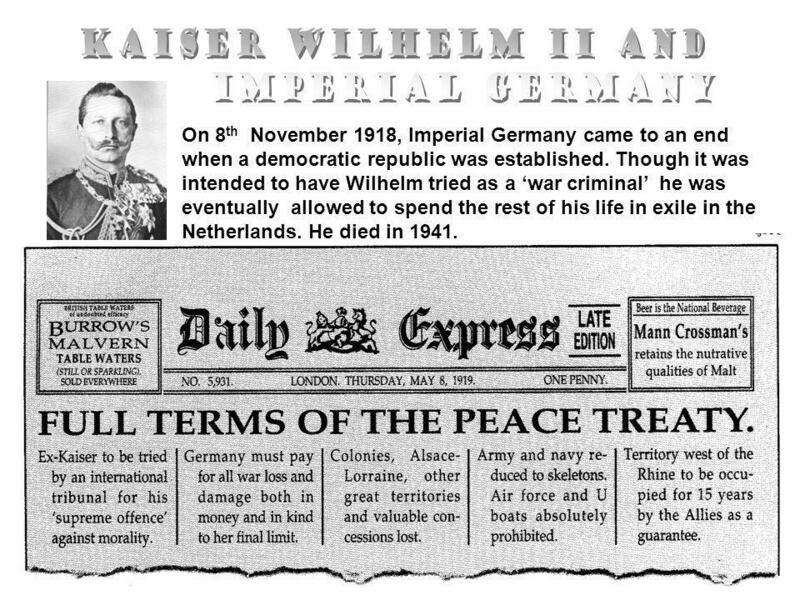 The Kaiser was forced to abdicate on the 8 th November and a new democratic republic was established. 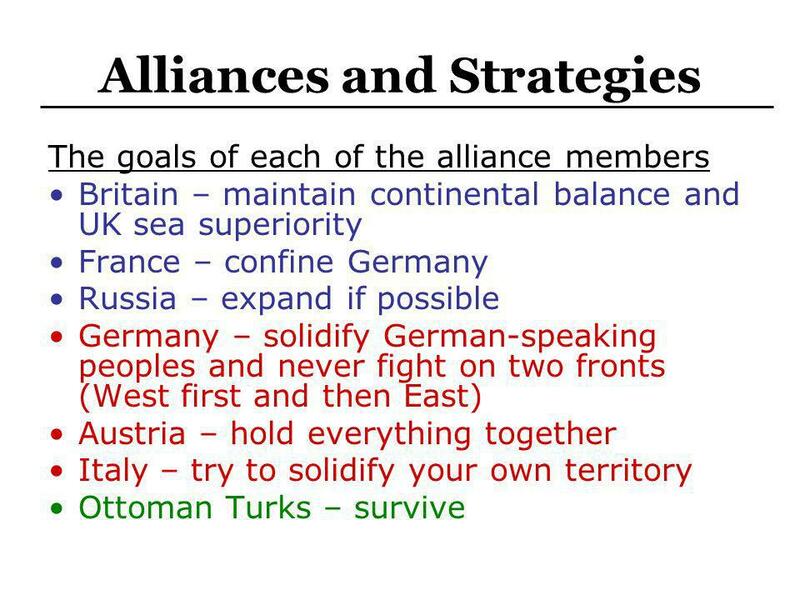 But how would the Allies deal with a defeated Germany? 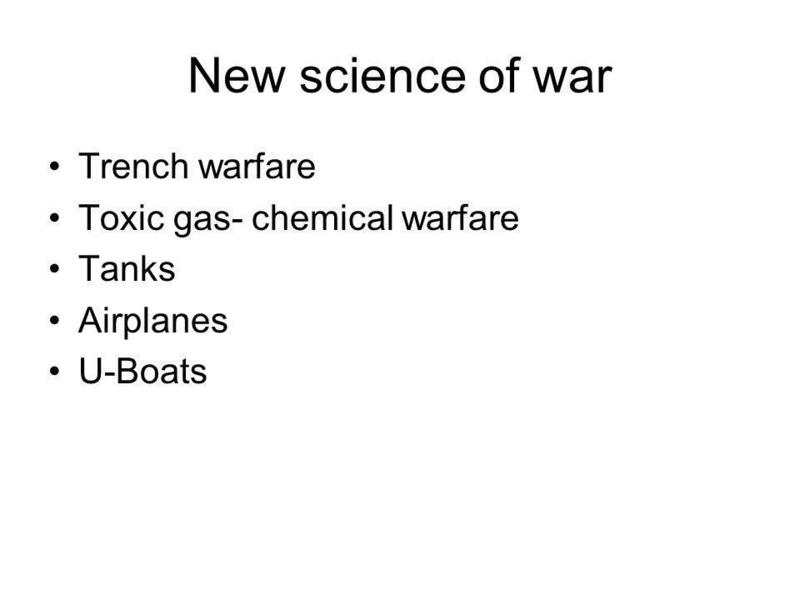 Militarism Alliances Imperialism Nationalism Glorification of the military Leads to increased suspicions between countries & made war more likely Readiness.